P. 258 x 396 mm., S. 327 x 495 mm. By repute from the collection of the painter Fritz Burkhardt (1900-1983), Munich. It was in Dresden in spring 1920 that Conrad Felixmüller introduced Otto Dix, a few years his junior, to the technique of drypoint etching. As Felixmüller remembers, he gave Dix a zinc plate and his favourite English steel etching needle. Only a few days later, Dix returned with his drypoint Kriegskrüppel ('War Cripples'), based on the painting of the same year. The painting was bought by the Stadtmuseum Dresden, but confiscated as "degenerate art" in 1933 and probably destroyed in 1942 in Berlin. 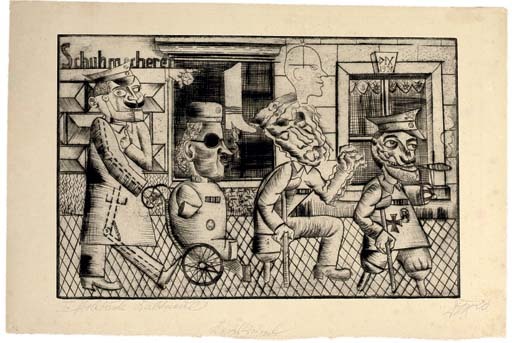 The drypoint, of which the present impression is a first trial proof, is now the only record of what is arguably Otto Dix' most important and poignant treatment of the consequences of war. Since 1919 Dix had been in contact with the Dadaists in Dresden and in Berlin. In 1920, George Grosz and John Heartfield invited Dix to the First International Dada Convention in Berlin and his painting of the War Cripples was chosen as the centre-piece of the exhibition. In the painting as well as in the drypoint, Dix used various elements of the Dada style - a certain mock-naïveté and one-dimensionality, the use of text and faux collage elements, allusions to X-ray images and technical blueprints - to portray a very real phenomenon: thousands of war cripples populating the cities of Germany. They were gruesome and pitiable reminders of the horrors of World War I; horrors that Otto Dix had lived through as a fighting soldier for the four years that the war lasted. Dix' artistic position, however, is not one of pity. Very much in the spirit of Dada, which Raoul Hausmann defined as "perfectly generous malice", the artist's attitude is one of mockery. As Eva Karcher wrote, "Dix added the spice of his own morbid and grotesque sense of humour to the Dadaist Zeitgeist, which had nothing but contemptuous disdain for any and all values and ideals." Between the painting and the drypoint version of the subject, Dix intensified his cynical stance even further: In the painting, the advertising sign in the shape of a human profile head served to illustrate the contrast between the ideal human form and the destroyed, incongruously re-assembled and jittering bodies of the cripples. In the drypoint, the head has turned into a sardonically smiling self portrait of the artist, overlooking this grotesque parade, this travesty of a military march, which Hans Kinkel likened to "an updated, demonised Procession of the Blind by Bruegel." Dix in this image has portrayed the war "as buffoonery, as a sarcastic farce" (E. Karcher). It is a bitter and ferocious attack on those who had not learned anything, who - like the cripples, still sporting their uniforms, their medals, their iron crosses - clung to their false ideals of patriotism, nationalism and heroism, which had lead to the war and to their own misery.